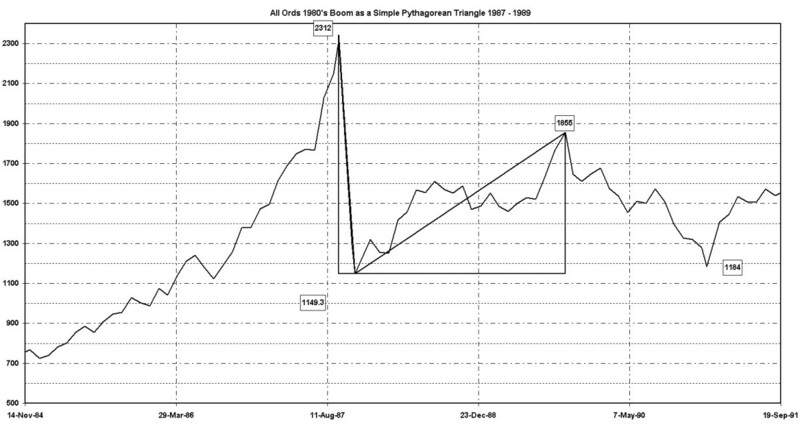 From July 1982 to September 1987 the market moved from 443.1 to 2312.5 on the physical and to 2343 on the Sep Spi. This represents an expansion of 523% which is just over twice the boom of 2003 to 2007 which moved the market by 256%. Like all massive booms it was followed by a crash which saw the market lose exactly half it value with the low on cash at 1149.3 and 1054 the Dec Spi on 11/11/1987 in the mid morning as I recall. 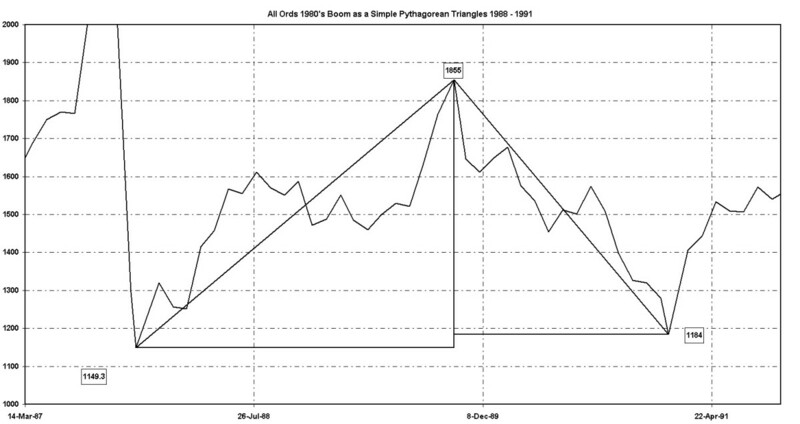 What we have here is a perfect Pythagorean triangle, where the rise over run or dy/dx is exactly equal to one. This is no small coincidence. The rate of change for the entire boom was 1 point per calendar day. This is a very important clue as to what the true internal dynamics of the All Ords are, and as such how all financial markets work. 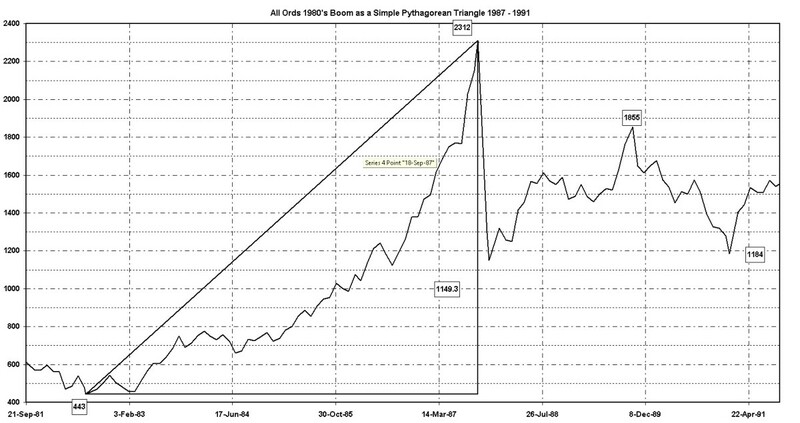 What this is showing you is the first underlying derivative of the market was constant for 1899 days. If you use a 360 day year dt = 1869 add this 443 you get 2312 . Therefore the change in price for the entire boom of the 1980’s was equal to the change in time. This asks the question, are we looking at a proof that as the old saying goes time is money. Change in time = Change in price. The next thing the market did after opening on the Monday was lose 50% of it value in 51 days. The greatest rate of change the ASX had ever undergone was on the 20th of October 1987 when it lost 20% of its value by mid morning with most of damage being done by 10:30 when the market was fully open. It then rallied in a standard set of moves that bought back 61.8% of the loss in the crash. All very standard text book stuff. What however is not seen by the naked eye is the fact that the time it took to recover was solvable from information available to you long before the fact. The Exact high occurred on 6/10/89 @ 1855. If you are taking half the sum or the difference of two numbers you are calculating a beat frequency which again falls into the area of wave propagation and spectrum analysis. To solve for the spectrum of the market is another way of saying to find the frequency or the length of the cycle. This cannot be done using the Roman calendar and the base ten numbers. The Calculus implications of this cannot be understated.